When pollutants impair the use of water a study is required to determine how to reduce them and restore water quality. This study is called a Total Maximum Daily Load (TMDL). A TMDL establishes the maximum amount of a pollutant allowed in the water while maintaining all of its designated beneficial uses. Two Reports related to TMDLs have been developed for the Provo River Watershed. They are the 1999 Upper Provo River Water Quality Management Plan and the Deer Creek Reservoir Draining TMDL Report. In 2002 a comprehensive study to develop a TMDL for Deer Creek Reservoir was initiated. This study included not only water quality analysis, but also computer modeling of Deer Creek Reservoir to test various water quality input scenarios. Additionally, fishery studies were conducted to also identify the health of the reservoir. 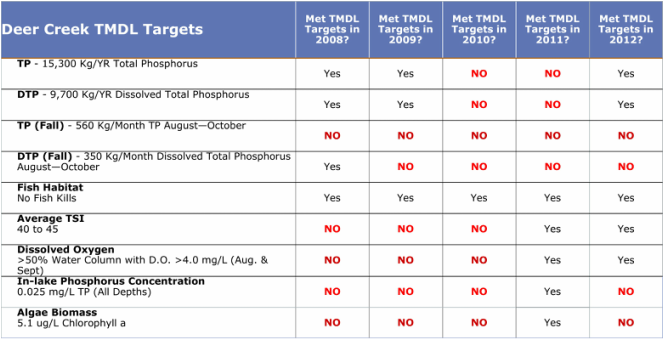 A list of various TMDL targets was developed and is shown at right. This also shows whether the targets have been met for recent years. A Water Quality Management Plan was developed for the Provo River, and Deer Creek and Jordanelle Reservoirs in 1984. In 1999 many of the recommendations from the 1984 plan had been implemented, however, the loadings and concentrations of various pollution indicators still remained high. In response to this disparity, a review of the management plan was commissioned. Also, at the same time, the EPA had initiated requirements for States to develop calculations of Total Maximum Daily Load (TMDL) values for waters not meeting beneficial uses. This report provided TMDL calculations for phosphorus for five stream segments on the Provo River as well as three other stream segments on Snake Creek, Daniels Creek and Main Creek. Also, a TMDL was calculated for one point source, the Kamas Fish Hatchery. Require developers of Mayflower Mountain Resort to stabilize the Mayflower tailings ponds. Continue the work and funding of the Deer Creek/Jordanelle Technical Team. Consider other restoration techniques/projects or phosphorus reduction programs.